The Berges Family Foundation | The Rep Theatre St. Louis | Get Involved! It’s no secret that Jim and Cathy Berges love the theater. They’re generous supporters of the Repertory Theatre of St. Louis, Opera Theatre of St. Louis, Stages St. Louis and the Center of Creative Arts. Last year, the Berges Family Foundation pledged $5 million to COCA, the largest gift the foundation ever made and equal to the largest gift COCA ever received. 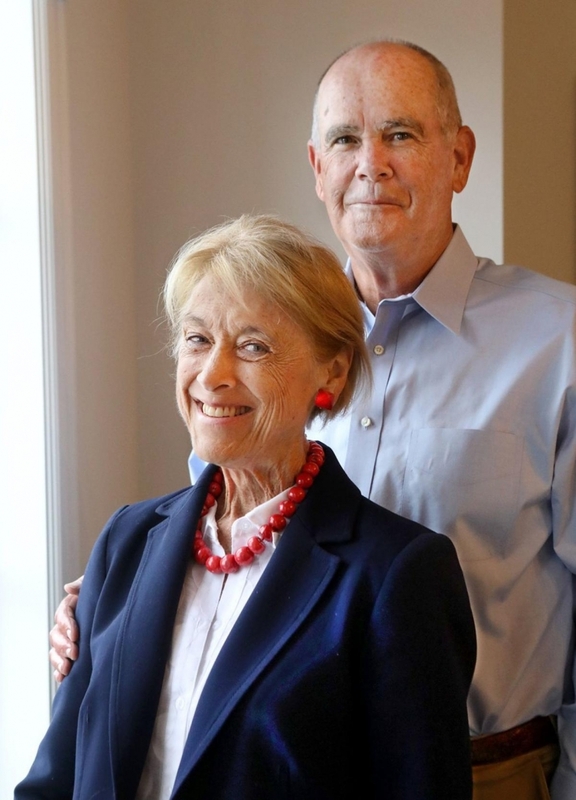 Worthy causes all, and all among the reasons that the Clayton couple received the 2017 excellence in philanthropy award from the Arts and Education Council of Greater St. Louis. But sometimes, everybody likes to gamble. How else to explain their decision to co-produce a new Broadway musical, “The Prom”? They may have little control over “The Prom,” but they do have reason for confidence. The director/choreographer is Casey Nicholaw, whose credits include “The Book of Mormon,” “The Drowsy Chaperone” and the new hit starring Taylor Louderman of Bourbon, Mo., “Mean Girls.” Bob Martin (“The Drowsy Chaperone”) and Chad Beguelin (“Aladdin”) wrote the book, Beguelin wrote the lyrics and Matthew Sklar (“Elf”) is the composer. The show tells the story of what happens when some Broadway characters (one of them played by Tony-winner and Muny favorite Beth Leavel) hear about a school that cancels its prom rather than let two girls attend together. When they head to Indiana to set things right, cultures clash like cymbals. Opening Nov. 15 at the Cort Theatre, “The Prom” might be the next big thing. But you never know, do you? Somebody believed that every Broadway flop was destined for glory. Jack is Jack Lane, executive producer of Stages St. Louis and, in recent years, a Broadway producer as well, on such shows as “Peter and the Starcatcher,” “Fun Home,” “The Humans” and “The Play That Goes Wrong.” “The Prom,” however, is his first outing as a lead producer. “I didn’t think I would be a lead producer for a number of years,” Lane said. “But I love this show so much I had to go down that road.” He explained that lead producers, who raise most of the money for a show, are deeply involved in every aspect. Co-producers, whose names also go above the title, are also involved behind the scenes. Investors put money into the show, but not as much. The Bergeses know all about that. “The first thing we did was ‘High,’” Jim Berges said with a smile. A drama about addiction that starred Kathleen Turner as a nun, the Repertory Theatre of St. Louis was one of its producers. It played here before it went to New York, where it closed after eight performances, the shortest-running production of the 2010-11 season. But they weren’t deterred. Since then, they’ve have invested in a number of New York shows, among them “Falling” and “Bandstand” with another St. Louis-based producer, Terry Schnuck, and in several of Lane’s shows. Sometimes it pays off, sometimes it doesn’t. But since they can do it, Cathy Berges says, why not get involved in something that gives them so much pleasure? “We see everything,” she said, estimating that she and her husband see at least 36 plays a year in New York alone — plus plays in St. Louis and Louisville, Ky. (his hometown, and where they maintain a subscription to Actors’ Theatre) as well as plays anywhere else they go. “We have learned our lessons,” he said. The couple — coming up on their 50th wedding anniversary — met at a party when he was a Notre Dame undergraduate and she was a nursing student at nearby Holy Cross. Neither one of them had much interest in theater. After they moved to St. Louis, where they raised their son, Kevin, they got involved in the community. (And not just in the arts. In 2016, the Berges Family Foundation gave $1 million to the Ranken Jordan Pediatric Bridge Hospital in Maryland Heights. They have supported an array of other organizations, too.) Each of them served on boards all over the community, but they’ve cut down on that because they travel so much. They don’t travel only to see plays, but that’s part of it. He loved “Oslo,” the drama about the Middle East Peace talks, because of its focus on negotiation. (“I’ve done a lot of that.”) She loved “The Humans.” “Some people always want to be uplifted,” she acknowledged, “but ‘The Humans’ is a good (if not uplifting) play.” Her eclectic tastes also encompass “The Curious Incident of the Dog in the Night-Time,” “Matilda” and the “Sweeney Todd” revival in which the actors played the instruments. Both of them loved “Hamilton,” which they saw as a new offering at New York’s Public Theatre. “I would have happily sat there for six hours,” he said. And sometimes, like theatergoers everywhere, they’ve been disappointed. But whether they’re just watching, or involved in the fortunes of a show, “it’s always fun,” Cathy Berges said.